Shopping can be expensive, we all know that. When it comes to getting the latest pair of shoes, that must have dress or handbag ‘to die for’ - it can often be an agonising choice. So when you see that huge discount on your Instagram feed - that you know it too good to be true - you’d be crazy not to go for it, right? Or perhaps you don’t mind buying a fake if it looks ‘good enough’? Everyone wants the perfect outfit for a good price. but when shopping online there is one thing you exepect to be correct - the fit and feel! This includes the cut, size and feel of an outfit. Brands will make sure to stick to the standards for the region/country when it comes to sizes. For example, a size named ‘large’ In the United States may not be the same as in China. Counterfeiters often just want things to look right at a glance and will have no problem if they don't match regional standards. Also that image they used to sell the product? It might not be legit. 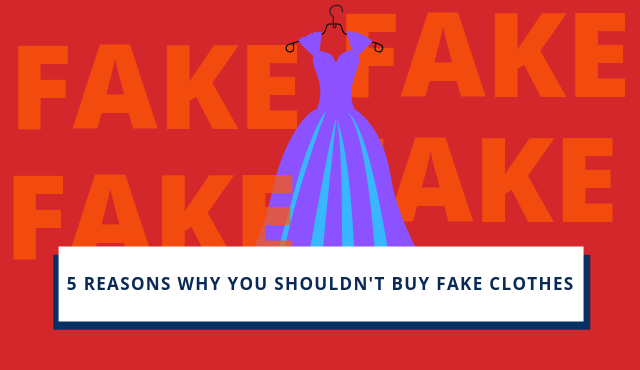 Often counterfeit products are advertised with the image of the genuine product… but of course, the materials used in the fake are usually inferior. So that beautiful dress might have rough unattractive fabric in reality. We don’t blame shoppers for not looking past the picture & price on an online shop. Retailers have spent years trying to persuade us to impulse buy - one-click purchasing and notifications of how little stock remains - all come to mind. But, unlike real companies, counterfeiters don’t have to follow the usual rules. There is no Corporate Social Responsibility scheme for these organisations. They will do anything to cut corners and save money, including using illegal forms of labour in the production of counterfeit products. We all know that this isn’t the most exciting thing to think about when shopping online, and is way down your list of priorities. But it is important! Producing clothes is a complex process with many stages. Often these involve treatments to the fabric that contain harmful chemical. Of course in legitimate clothing, this is carefully handled so not to risk consumers. Counterfeiters on the other hand? They’re not so careful. A number of these chemicals used could be absorbed into the skin If improperly handled during the production process. Retail is a highly competitive business. You might have noticed big name brands being bought by another company or shutting down completely. Revenue matters, even for bigger companies. Counterfeiters can piggy-back off the hard work of brands, and push users away from genuine retail stores. Counterfeiting is big business. And when we say big, we mean a €60 billion business in the EU alone. And that money isn’t going to shareholders or investment; it’s often heading towards criminal organisations. And organised crime doesn’t just stick to one kind of illegal activity. The profits from counterfeiting will spread across all their schemes, whether that’s drugs, bribery, violent crime etc. ...intellectual property crime is becoming the preferred method of funding for a number of terrorist groups. The idea that counterfeiting is a victimless crime just doesn’t stand up to scrutiny. Think beyond the low price to the consequences your purchase may have! At Scamadviser we want to help you avoid the worse of the internet. But in the end, it is your choice. We genuinely believe that these counterfeiters don’t have your best interests at heart. They pose a risk to your online safety, and countless others behind the scenes. Let's work together to make the internet a safer place!